What Trump Can Learn from Oliver Stone’s "Putin Interviews"
EXECUTIVE SUMMARY: The July 2015-February 2017 interviews with Vladimir Putin by US filmmaker Oliver Stone, now streaming on Showtime, provide surprising insights into the mind of the Russian leader. “We like President Trump,” Putin admits, recalling that during the election campaign Trump was open to a new relationship with Moscow. Further progress was stalled by Russo-gate. Trump should not buy Putin’s reasons for his Ukrainian and Syrian interventions, but would be wise to be open to renewing a limited partnership with Russia against Islamic terrorism and Pyongyang’s rogue regime. President Trump must remind the Russian leader that his election intervention denials have been exposed as false, as US intelligence was able to record his June 2016 orders to hack Hillary Clinton’s emails. However, he should also address Putin’s charges that twice – during the 2000 and particularly the 2012 Russian elections – Washington aggressively rallied the opposition and funded anti-Putin events. Putin also accuses US diplomats of supporting, controlling, and funding NGOs seeking to influence the outcome of elections. He thus implies that his interference in the 2016 US elections was payback of sorts. Henry Kissinger has described Putin as a “cold calculator of Russia’s national interest” and a “Dostoevsky character.” Indeed, much like Dostoevsky, the Russian president underwent a Kafkaesque metamorphosis from young, progressive revolutionary to conservative thinker and fierce defender of empire and orthodoxy. Stone makes clear, however, that he does not know what to make of Putin’s repeated references to God or his stance as defender of the Orthodox faith, which the Russian leader addresses when he takes him into his private chapel at his dacha. Eventually Putin concluded, however, that privatization and the transformation of Russia to capitalism under Yeltsin were too chaotic. Thus, he came to preside over state capitalism and a highly controlled market economic system. Trump should not be confused by Putin’s skillful selling of Russia as a genuine democracy. It is not. Nevertheless, Trump should explore closer cooperation between Moscow and NATO. Can the partnership with Russia that prevailed during the early George W. Bush years in Afghanistan be restored? And if so, how? Americans were happy when the Libyan dictator was killed in 2011, but, as in Iraq, the war in that country became a catastrophe. Before Qaddafi’s death, there were few terrorists in Libya – but they came in as US-armed rebels, some of whom were jihadists, gained control of the country. Something similar could have happened in Syria, but the 2015 Kremlin intervention saved Assad from Qaddafi’s fate. The agreement on Syria with the Obama administration was that the two powers were supposed to perform strikes jointly there on designated terrorist targets. Putin blames the US for giving up on the agreement for political reasons. He also maintains that Moscow held discussions with the Obama administration on resolving the Syrian crisis, only to conclude in October 2016 that time had run out. The Russian Minister of Foreign Affairs would talk instead to the incoming US administration. Trump should not take seriously Putin’s explanation that the intervention in Georgia happened simply because of the aggressiveness of Georgian leader Saakashvili. This is only part of the story. Nor should he buy Putin’s convoluted expositions on the conflicts in Crimea and eastern Ukraine, both of which began with Russian military intervention. Trump should lift western sanctions only if Putin volunteers to withdraw his forces from Ukraine and to recognize its territorial integrity and neutrality. The crescendo of the interviews comes when Stone argues that he himself is neither pro-American nor pro-Russian; he is pro-peace. 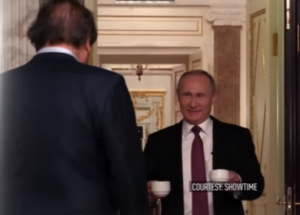 Putin lectures the Hollywood leftist, “…You’re a man of peace. And I am pro-Russian … You are too anti-American, and I don’t want to be dragged into it.” Clearly this is a message for Trump that Putin understands his strategy of “America First.” Trump defends his country’s vital national interests, and so does Putin. Russia First! The art of the deal is to reconcile the interests the two powers have in common. This will not be easy. Putin does not reveal the details of his phone conversations with Trump on North Korea, which launched its first ICBM on America’s Independence Day. This move will likely be met by a strong, perhaps military, response by the US. But no matter what response Trump chooses, he will need Beijing’s and Moscow’s strong cooperation on both North Korea and Syria. Trump should use his skills at the art of deal-making to end the new Cold War with Putin. America and Russia need each other. Dr. Jiri Valenta is a noted expert on Russia, the US, national security, and terrorism. Author of Soviet Intervention in Czechoslovakia 1968 and co-editor and contributor to Soviet Decision-making for National Security, he is a former tenured associate professor and coordinator of Soviet and East European Studies at the U.S. Naval Postgraduate School and a member of the Council on Foreign Relations. He is indebted to his partner and wife, Leni Friedman Valenta, editor-in-chief of jvlv.net and CEO of the Institute of Post Communist Studies and Terrorism, with whom he recently published Washington and Moscow: Confrontation or Cooperation? at the BESA Center.